As of November 7, 2017, SCSRA has been officially dissolved. 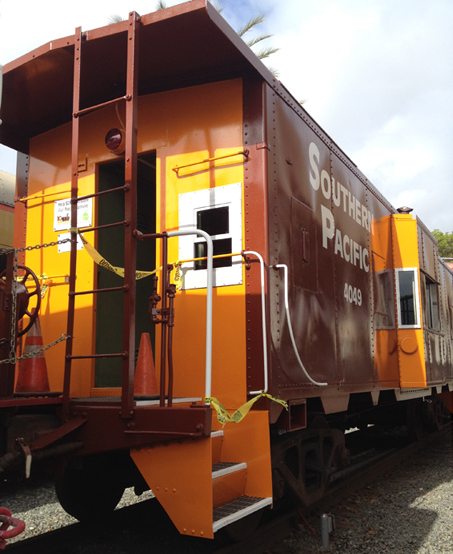 The association's assets, including the two cabooses, and members now belong to the SCRPA, which runs the Fullerton Train Museum, usually open for tours on weekends (when weather permits) at Fullerton Amtrak Station. This website remains as an archive of SCSRA's proud 33-year history of community service. Welcome to the SCSRA website, which features activities of the Southern California Scenic Railway Association, Inc., a nonprofit educational corporation dedicated to promoting public appreciation of Southern California rail history and rail safety. The SCSRA's current focus is assisting the Southern California Railway Plaza Association (SCRPA), in their annual Railroad Days event, as well as their worthy long-range goal of operating a railroad museum, in Fullerton, CA, which has produced the Fullerton Train Museum. Be sure to drop by the Library and read the latest additions, such as The Seven Eras of Rapid Transit Planning in Los Angeles by Robert P. Sechler. There's also plenty of interesting reading in our newsletter archive. © 1992-2018 The Southern California Scenic Railway Association, Inc.